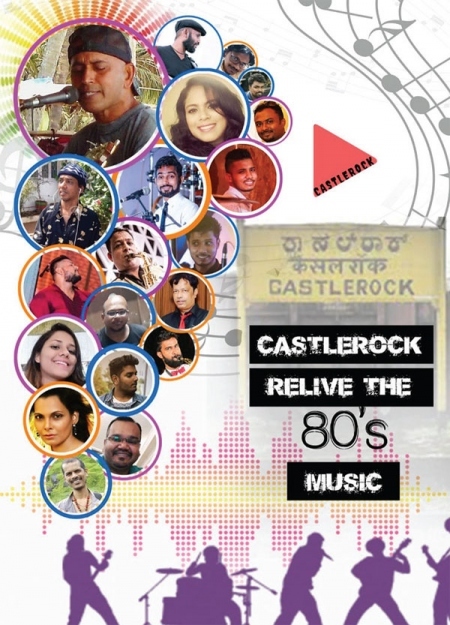 But for some who have preserved the treasures of rock music come together on April 13, 2019 to revive those Oldie Goldie’s in a concert called Castlerock 80’s that involve musicians of Goa from the late 60’s, 70’s, 80’s and 90’s. as the coordinator. The other members include Silvia, Sheryl, Stacie as professional singers, Nilesh Faterpekar, Nigel Mendonca, Placido Rodrigues, Olavo Fernandes, Johny Pereira, John Lino, Sheldon Gomes, Linus Fernandes, Peterson Gomes, Eularia Gomes, Kassel Gomes, Aditya Naik, ShivrajBekere and Angio Fernandes as the youngest. Castlerock, is a special dynamism giving the forefront to young budding musicians and having elder members from various other bands spanning across four decades as the backbone of the concert. Together they celebrate the age of rock bringing back memories and music from the 80’s. The band will perform list of seven songs sung by ‘The Teens’ in the 80’s.
. Castlerock is not just a name, but a beautiful village situated in the Western Ghats on the state’s border with Goa - at an elevation of 621m with a grand view of Dudhsagar. Inspired by its alluring scenery and living amongst the aesthetic grace, Pravas Ravi initiated the idea of bringing back the 80’s and naming the band and concert after the place he comes from. “No, I didn’t fall in love, she fell in love with me, music did!” says the man who first wielded the electric guitar in 1988 hitting his teens and the right notes too. musician, lyricist, singer and conductor, is one among them all who lived the ages of Rock. Now that’s what makes a name so perfect! Roque. Roque entered his journey of music through the band ‘The Teens’ in 1988 by Allan Fernandes his classmate;it was indeed the 1st teen band in India during the rock music period. He had learnt singing solfeggio with his grandfather (a bass drum Cymbel player)at a very young age and learnt playing the guitar with neighbors from is village. He has been awarded the YuvaSrujanPuraskar (Youth State Award) for excellence in western music in 2014 by the government of Goa. “Guess it was just destiny, who knew I would reach so far. But I am proud that I’m on solid ground,” he says.